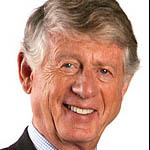 Over the course of 26 years as anchor and managing editor of the ABC news program, “Nightline,” Ted Koppel became the longest serving and most honored news anchor in U.S. broadcast history. After leaving ABC in 2005, Mr. Koppel produced 20 hours of documentaries for the Discovery Network, where he served as managing editor. Since then he has worked as a contributing analyst for BBC America and a special correspondent for the NBC News magazine program, “Rock Center.” A member of the Broadcasting Hall of Fame, Mr. Koppel has won every major broadcasting award including 42 Emmys, eight Peabody’s, and two George Polk Awards. His most recent book is the New York Times bestseller, Lights Out, which examines and evaluates potential ways for America to prepare for a cyber-catastrophe. And as of February of this year, Mr. Koppel has been working for CBS News as Senior Contributor to The CBS Sunday Morning Show. With Palestine taking a spotlight in the elections and people (like me) becoming aware of the nature of Israel’s occupation, isn’t it plausible the hack was a reminder from Israel, not Russia? Wasn’t it aimed at shutting down social media, the main conduit of Israel’s criticism?